She’s an Assamese lassie who sings in Bhojpuri. When most musicians vie for contemporary forms of music, Kalpana Patowary headed in the direction of folk and has established herself as a sought after Folk Music vocalist of our time. Parmita Borah talks to the lady herself about her rendezvous with music. Parmita Borah: Although you’re from Assam, you have voiced more songs in Bhojpuri language. What inspired you? Kalpana Patowary: Frankly speaking, being from Assam, we Assamese artists have a very dangerous ‘accent’ problem. Even I face it. However, much before me, Dr. Bhupen Hazarika paved the way when he made a traditional Assamese wedding song into a Bhojpuri song (bursts into as song by Dr. Bhupen Hazarika). People like Dr. Bhupen Hazarika made it large even with Bhojpuri songs. Similarly, Jyoti Prasad Agarwala was from Rajasthan but took on Assamese music and gave a new direction to it. So they have all inspired me. PB: You’ve mentioned that Assamese artists have trouble with the accent. So when it comes to mastering the ability to sing in Bhojpuri and getting accepted by the Bhojpuri people themselves, was it a challenge for you? KP:If some tells you to write in Gujrati or Bhojpuri out of the blue, you will face a problem. Be it the literature perspective or grammatical, it’s bound to be a challenge. But I simply went with the flow. Currently I am singing in 23 different languages, somehow Bhojpuri clicked. I don’t know how. KP: Yeah. I am doing a research, a thesis sort of work on the legacy of Bhikhari Thakur. He is like Assam’s Dr. Bhupen Hazarika or Bengal’s Rabindra Nath Tagore. Bhikhari Thakur is a personality of that category. About hundreds of years ago, during the British Raj, a lot of people from UP and Bihar were taken out as labourers, to places like West Indies, Trinidad, Tobago and Fiji. Now, I’ve been called by the Government on West Indies because the people over there want to their roots, their musical roots. They know that they are basically from UP and Bihar, but don’t know much beyond that. It’s an irony that an Assamese girl will introduce them to their own roots. It’s actually very interesting. PB: Tell us something about you upcoming album Mai-re. KP: Mai-re is a Hindi album. About three-four years back, when I began to taste success, there was also a vacuum forming inside me simultaneously. I was searching for something inexplicable, that search led to Mai-re. The emptiness that was around despite the rush around me, that’s Mai-re. The whole world, its global warming and its negativity, everything that’s going on, Mai-re is all about that. PB: Let’s talk about JUNOON…..Kuchh Kar Dikhaane Ka. The show shot you to nationwide fame. How was the experience? KP: Thrilling! It was a where I discovered more of myself. Basically I was called for the UP/Bihar group. “Maati Ke Laal” was its name. But I spoke to the production team, that being from Assam; I wanted to show the Assamese folk as well. Finally I managed to represent UP/Bihar and Assam. 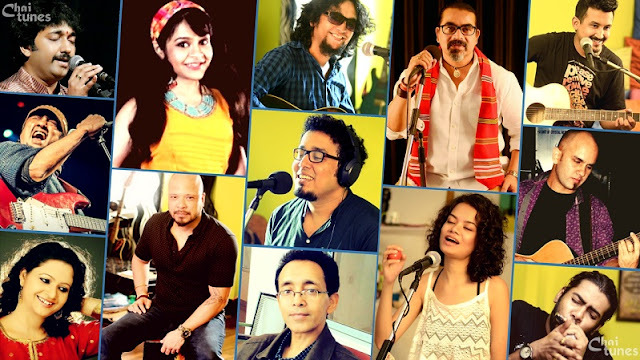 Assamese music was widely accepted and liked on the show. PB: You made quite a splash with Billo Barber and Khatta Meetha. Are you planning to focus entirely on Bollywood? KP: Bollywood is not that important for me now. Work keeps coming and going, but I am not concentrating only on Bollywood. PB: Northeast has many talented singers and musicians. Do you think they have been successful on a national level? KP: Ofcourse, Northeast guys are very talented-not just musicians, but technicians as well. But somehow we lack a certain fighting spirit and the will to promote ourselves. It’s not possible to survive only on talent- one has to market herself/himself properly. The mindset that that we are from Northeast, we are backward is very negative and we need to lose that to succeed. PB: I was about to ask you for a message for aspiring musicians, but you’ve already covered that. I’d like you to leave a message for our readers now. PB: Thank you so much for joining us.